Situated on a curve of the Guadalquivir River, with countryside spreading out in every direction, Cordoba boasts a fascinating and romantic history. The former capital of Al-Andalus (the Muslim-controlled parts of medieval Spain) Cordoba in its heyday was a magnificent representation of Moorish power. Its former mosque, the Mezquita, is one of the most spectacular Islamic buildings in the world; visitors today remain entranced by this remarkable piece of architecture, in addition to Cordoba’s charming medieval quarter, which comes alive at night with its atmospheric cafes, tapas bars, and restaurants. Cordoba began life as a Roman settlement, founded in 152 BC by a Garrison who were attracted by its strategic position on the Guadalquivir River. The Romans controlled Andalusia – known as Baetic – for centuries, having wrestled control from the Carthaginians during the Second Punic War. Cordoba prospered under Roman rule, and soon became one of the most civilized and wealthiest areas of the empire outside of Italy. During this period, Andalusia and indeed Cordoba experienced several major cultural and technological changes. The Romans introduced aqueducts, temples, amphitheaters and bequeathed Spain its language and the basis of the modern Spanish legal system. However, following the collapse of the Western Roman Empire, Cordoba fell into decline. The Germanic Visigoth tribes took control of most of the Iberian Peninsula in the 6th century AD and made Toledo in central Spain their capital. Nonetheless, their rule over Hispano Romans was precarious and by 700, with famine in Toledo and chaos throughout the Peninsula, Visigoth control was falling apart. This paved the way for the Muslim invasion of 711, which set Spain and Cordoba’s destiny apart from the rest of Europe. After the invasion in the 8th century, Cordoba became the Muslim capital of the Iberian Peninsula and a new era of prosperity dawn across Andalusia. In the 10th century, Abd ar-Rahman III named himself caliph and ensured that Al-Andalus was ruled independently from the Moorish kingdoms in the Middle East. Under his rule, Cordoba’s population grew significantly and the city became the largest in Western Europe. Its wealth was renowned across Europe, as was the city’s architectural wonders, which included mosques, patios, gardens, and fountains. It was a magnificent time for Cordoba’s citizens. In the latter part of the 10th century the caliph’s reign ended when a ruthless general, Al-Mansur took control of Cordoba and conducted several, bloodthirsty raids against Christian Spain. Following his death and the death of Al-Mansur’s son, the caliphate descended into anarchy, with rival Muslin factions and Christians from northern Spain fighting over the spoils of this once great city. Cordoba was looted by the Berbers on more than one occasion and eventually, Al-Andalus collapsed into several tarifas (small kingdoms). In the 11th century, Cordoba was ruled as part of the tarifa of Seville and was overshadowed by the city which grew in importance as Cordoba declined in both wealth and population. It became something of a provincial city, following Fernando III reconquest of Andalusia in the 13th century. Cordoba was captured in 1236 and much of its population fled, fearful of reprisals and persecution. Following the reconquest of Spain by Fernando III, Muslims were persecuted for many centuries. Cardinal Cisneros, an overseer of the Spanish Inquisition, carried out mass forced baptism and banned both books and the Arabic language. Eventually, Muslins were given an ultimatum – convert to Christianity or leave. The fanatical Spanish King Felipe II took it one step further, expelling Moriscos (converted Muslims) from Spain altogether from 1609 to 1614. In the 17th century, Andalusia and Cordoba’s fortunes continued to decline. The last three ineffectual Hapsburg Kings had wasted much of the area’s wealth from its conquest of the Americas. Epidemics and bad harvests killed some 300,000 people and further reduced Cordoba’s shrinking population. Under the Bourbon dynasty of the 18th century, Cordoba’s fortunes recovered somewhat, although it would never again retain its importance as the economic and political capital of Andalusia. In the so-called Age of Enlightenment, with its faith in reason, science, and social planning, new industries sprung up in Andalusia, including Seville’s first tobacco factory. Sadly, by the latter half of the 19th century, Andalusia was once again mired in severe economic turmoil. The region declined into one of Europe’s most backward, socially-polarized areas with massive differences in standards of living between rich and poor. Illiteracy, disease, and hunger were rife. The industrial revolution that had transformed northern Spain had barely touched Andalusia. The defining event of Spain’s 20th-century history was The Spanish Civil War between the military dictator Franco and the Republican government. Both sides committed terrible atrocities, including the murder of 7000 priests, monks, and nuns. Franco declared himself the victor in 1939 and remained in power until 1975. He kept Spain out of both World Wars, but under his dictatorship personal freedoms were severely restricted – divorce was made illegal and church weddings were compulsory. Since Franco’s death and Spain’s relatively painless transition to democracy, Cordoba, like Andalusia as a whole, became steadily more prosperous and recovered some of the confident of its glorious heyday. Today, its stunning architectural heritage and cultural significance make Cordoba an unmissable part of any Andalusian itinerary. A stunning monument to the legacy of Spain’s Moorish past! Andalusian cooking is an ethnic melting pot of diverse culinary influences, including Roman, Jewish and Arabic. The Arabic is the most distinctive: among other things the Muslims introduced lemons, apricots, mint, spinach, and spices such as cumin and cinnamon to the region. Throughout Andalusia, the fruit and vegetables are delicious and fresh, for the growing season is almost year-round. Yet, local food remains fairly traditional and conservative, although younger chefs are passionate about the experimental and avant-garde in Spain’s larger cities. Of course, Andalusia’s most famous culinary contribution is tapas, which today come in an indefinite variety and are essential to the Spanish way of life. History records that today’s snacks originated in the Sherry region in the 19th century when bar owners placed a bit of bread on top of a drink to deter flies; this developed into the custom of putting a snack on the bread, to encourage drinking. 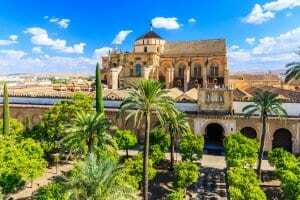 Cordoba, although one of the region’s smaller cities, nonetheless offers a lively culinary scene, with many of the city’s classy restaurants preparing food in medieval styles – delights such as garlic soup with raisins, or lamb stuffed with dates and pine nuts. 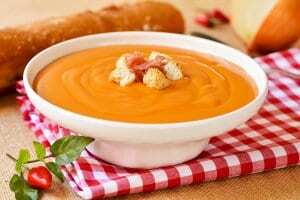 Local highlights include Rabo de Toro (oxtail stew) and salmorejo, which is like a thicker gazpacho served with bits of boiled egg on too. One of our favorite haunts is Taberna San Miguel, still one of Cordoba’s most popular and atmospheric tabernas. The food is excellent, as is the selection of local wines. El Churrasco is another great find, which specializes in delicious meat dishes, including barbecued fillet of pork with an exotic Arabian sauce. Andalusia is renowned for Jerez or Sherry, a fortified wine produced in the towns of Jerez de la Frontera, El Puerto de Santa Maria and Sanlucar de Barrameda. However, Cordoba has its own local version, produced in the nearby regions of Montilla and Moriles. The wine is similar to Sherry, made by the same process except that it isn’t fortified with the addition of Brandy. Like Sherry, it comes in different styles, the three main ones being Fino, Amontillado an Oloroso. Finos work particularly well with tapas, and can cope with the wide range of flavors on offer. In addition, most restaurants of Cordoba will offer a selection of wines from across Spain, including sparkling Cava, Rioja and the mighty reds of Ribera Del Duero. Cordoba’s great Mosque, dating back to the 12th centuries, is the most remarkable piece of Islamic architecture still standing in Europe today. It embodies the power of Islam in Spain, built under the rule of Abd al Rahman I between 785 and 787. The building that stands today evolved over the centuries, blending many architectural forms. In the 10th-century Hakam II made some of the most lavish additions, including the elaborate mihrab (prayer niche) and masqsura (caliph’s enclosure). Other highlights are the beautiful arches and pillars, consisting of more than 850 columns of granite, jasper and marble, and the Patio de Los Naranjos. The heart of Cordoba is undoubtedly the old Jewish quarter, situated to the west of the Mezquita’s towering walls. It’s ideal for a leisurely early evening stroll, which is the best time to appreciate the district’s cobbled streets (free of cars) and delightful squares, full of cafes and tapas bars. In fact, a walk around this area gives the impression that little has changed since the 10th century when Cordoba was one of the greatest cities in Europe. Cordoba’s archaeological museum is housed in a Renaissance building with a large patio. 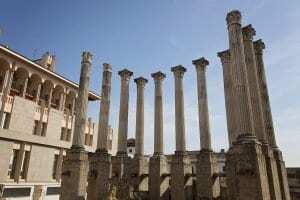 It contains a wealth of historical treasures, including an extensive collection of Roman artifacts, with large mosaics and elegant ceramics. There is also a section devoted to medieval Cordoba, including bronze animal figures from Medina Azahara. The Bishop’s Palace offers interesting exhibitions in its handsome patio that are well worth a look. The Palace also houses the Museo Diocesano with a collection of religious art including some outstanding medieval woodcarving.